Hida Ringo Lala is a 4.5% fruit beer from Ji-Beer Hida, based in Hidatakayama, in Gifu, Japan. It’s part of their fruit range of beers, with the other being their Hida Yuzu Lala beer. 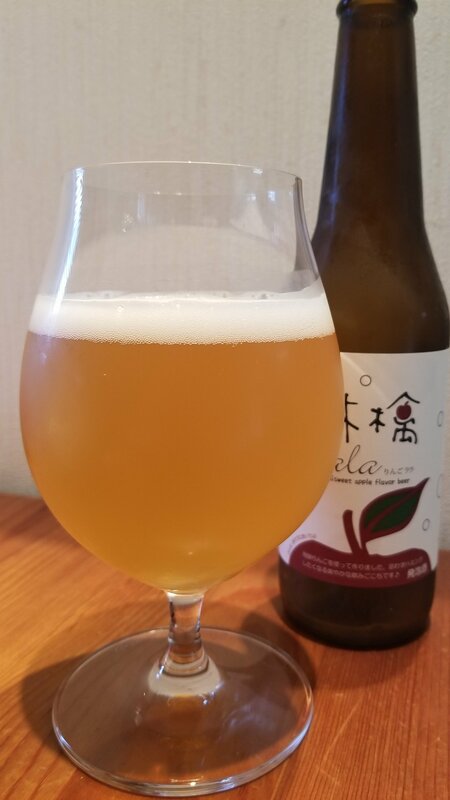 Hida Ringo Lala is brewed using the juice of apples and wheat sourced from the Hidatakayama area, as well as additional vitamin C – so you can be healthy as you drink. Hida Ringo Lala is a beer – just! It certainly looked like a beer, with its slightly hazy golden body and frothy white head but the distinct apple aroma made it smell more like a hopped cider, along the faint lemon aroma coming off of it. The malts were nigh on indistinguishable until Hida Ringo Lala had warmed up, which on a hot summer’s day wasn’t going to take long. The initial apple bite faded to leave a slight biscuit malt taste on the tongue. The hops brought a slight lemon twist to Hida Ringo Lala, though with every sip of the beer, the apple flavour remained longer and longer. It wasn’t unpleasant but it would have been nice to have this as a cider instead perhaps. Hida Ringo Lala finished off with a lingering apple and lemon flavour before fading to a slight sticky sweetness on the palate. Hida Ringo Lala is a drinkable beer but isn’t going to set your tastebuds alight.